San Francisco, September 13, 2018 - Florida-based Incredible Adventures has been sending individuals to San Francisco’s Farallon Islands to dive with great white sharks since 2005. Each year, adult white sharks the size of cars migrate to the remote islands to feed on the local seal population. This year’s San Francisco shark diving season runs from Saturday, September 29 to Saturday, November 17. Shark divers board the Derek M Baylis before dawn, at San Francisco’s Pier 40/South Beach Harbor. The marina is located next to AT&T Park, home of the San Francisco Giants. The Baylis is a 65 ft powered sailboat, custom built for offshore research and education and provides a comfortable ride across rough seas. "Our people really want to see white sharks too, so you can trust they'll do everything they can to find sharks." Estimated travel time to the white shark feeding grounds is three hours. On the way to the islands, a light breakfast is provided, and a Sanctuary-certified naturalist shares information about the sanctuary. The morning briefing includes detailed white shark information, including tips for spotting signs of shark activity from the shark cage and boat’s observation deck. Incredible Adventures uses a floating shark cage and surface-supplied air on its shark viewing expeditions, so no dive experience is necessary. A certified dive professional oversees cage diving operations and provides all necessary instructions. The water at the Farallones is icy cold, so the $825 per person cage diving price includes the use of a heavy 7 mm wetsuit. Those who prefer to stay dry pay $475 to join one of the company’s twelve-hour expeditions as a topside observer. The islands lie within the protected waters of the Greater Farallones National Marine Sanctuary, so shark diving activities are tightly regulated. To help increase the likelihood of shark sightings, Incredible Adventures makes use of Sanctuary-approved seal-shaped decoys. Since the sharks are in the area to feed on the location’s population of elephant seals, most sightings occur during a dramatic and bloody feeding event. Chumming for white sharks is illegal in California under the State’s “anti-take” law and is also prohibited in the sanctuary under Federal law. Trips for individuals are offered on select weekend dates and can be booked online or by telephone. Private one-day and overnight shark expeditions can be arranged other times. 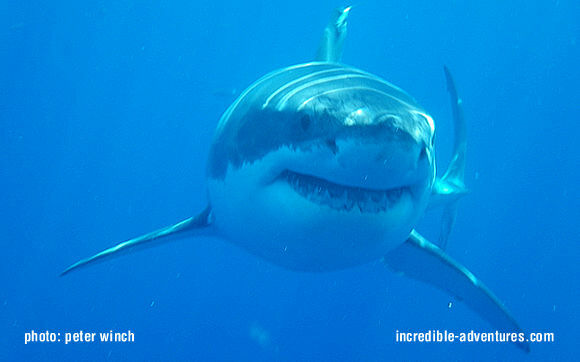 For more information, visit http://www.sharkdiveadventures.com or call 800-644-7382. For more information, visit Shark Diving in the Farallones.